Factory Glock Sub Compact Frame. Compatible with G26, G27 & G33 frame internals. Slide options available are available in our drop down menu. Factory full size Gen 3 Frame. Factory Glock Compact Gen 3 Frame. Compatible with G19, G23 & G32 frame internals. 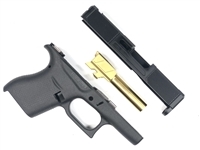 Compatible with Compact G19, G23 or G32 frame parts. Factory full size G17 Gen 3 Frame. Complete with 9mm trigger, ejector, magazine catch and locking block. Factory full size G19 Gen 3 Frame. Factory full size G43 Frame. Complete with trigger, ejector, magazine catch and locking block. Factory full size G34 Gen 3 Frame. This is the competition model which features extend magazine release and 3.5LB dis-connector. 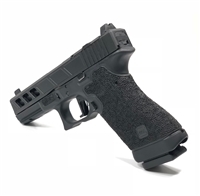 Our frame stippling will give your Glock frame a none slip texture. Borders to give the stippling a bold look. Turn around time 3-4 weeks. This is performed on the customer's supplied frame. Compatible with G19 9mm Gen 3 slide internals. Machined from 17-4 heat treated stainless. Nitrided for corrosion and wear resistance. 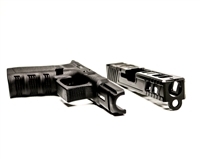 Features front and rear serrations for enhanced slide manipulation. Machined for the Trijicon RMR optic but also compatible with the Holosun 507c. 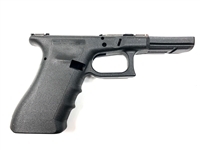 Factory Glock Compact Glock 43 Frame. Stripped Slide machined from 17-4 heat treated stainless w/ Black Finish. Features front and rear Diamond Checkered Serrations for enhanced non slip slide manipulation. Match Grade TiN Plated G43 9mm Barrel. Have your FFL Dealer email a signed file copy of their FFL referencing your order # to sales@alphaprecisionworks.com. Stripped Slide machined from 17-4 heat treated stainless w/ Gold TiN Finish.